Saucony introduced EVERUN "Continuous Cushion", top soles and inserts of TPU a plastic that maintains its impact absorbing properties 3X better than standard EVA and returns 83% of energy vs. EVA's 75%. Heel wedges which were POWRGRD or POWRGRD+ go to the Everun material. Less sensitive to temperatures the TPU topsole will provide a more consistent shoe feel during runs as shoes heat up, and across seasons. 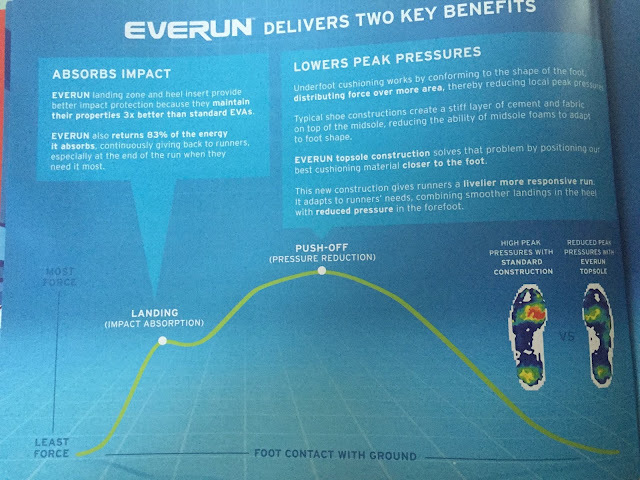 A material as well as a construction method, EVERUN positions "the best cushioning material" closer to the foot, below the sock liner and above the "board", a combination of fabric and cement that links the upper to the midsole in most shoes. 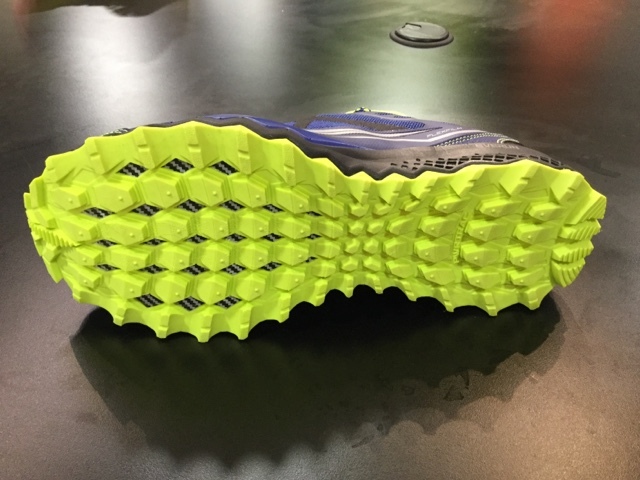 Saucony claims this approach will distribute impact forces over more area, reducing peak impact pressures and will give runners a "livelier more responsive run with smoother landings in the heel" and "reduced pressure in the forefoot. " Readers may recognize TPU as the same basic material as adidas' fantastic Boost but here instead of an entire or partial midsole it is applied as a topsole or layer above more conventional EVA. The EVERUN is not applied in the same way to all shoes. The Kinvara 7 and Peregrine 6 receive a heel insert, the Guide 9 a full length sheet of EVERUN and the Triumph and Huricaine ISO 2 a full sheet and lateral landing zone. 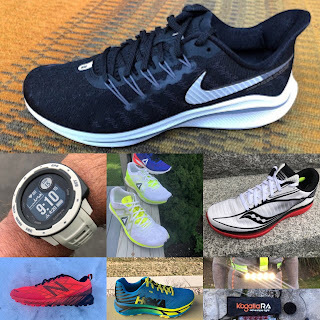 The very popular Kinvara now at version 7, really back when the first major shoe company model to apply lower weights and lower drops, gets an EVERUN TPU heel insert replacing the PowerGrid insert. I am curious to see how much rebound I get from the heel. I found earlier Kinvaras quite soft. The outsole gets a fuller contact chevron pattern eliminating the soft triangular forefoot lugs that I found somewhat unstable and soft. This change alone wants me to try Kinvara again! The bands forming the Triumph ISO 2 ISO cage (gray,black,white) are wider than the ISO 1 silver bands while at the metatarsals the overlays are moved back for a bit more room. 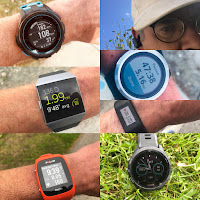 I recently ran and reviewed the ISO Triumph (here) and believe the full TPU EVERUN top sole plus lateral TPU landing zone on the lateral side may help attenuate the firmness of the very thick, very firm outsole rubber in the heel area of the ISO Triumph, its key shortcoming for me. Instead of pods the outsole gets a chevron pattern in the forefoot. The Triumph ISO 2 comes in at M 10.2 oz 289 grams W 8.6 grams. 30mm heel, 22 mm forefoot. Available 11/1/15. $150. The support model in the ISO line gets a new ISOFIT upper as well as the EVERUN TPU topsole and landing zone as in the Triumph ISO 2. M 10.8 oz 306 grams, W 9.4oz 266 grams. 30mm heel, 22 mm forefoot. Available 1/1/16. $160. The supportive guidance Guide 9 gets a full length EVERUN topsole. M 9.7 oz 275 grams, W 8.2 oz 232 grams. Available 11/1/15. $120. The Peregrine 6 replaces its heel POWERGRID insert with EVERUN. It also gets the PWRTRAC outsole of the Nomad TR. M 9.4 oz 266 grams W 8.5 oz 241 grams. Available 1/1/2016. $120. 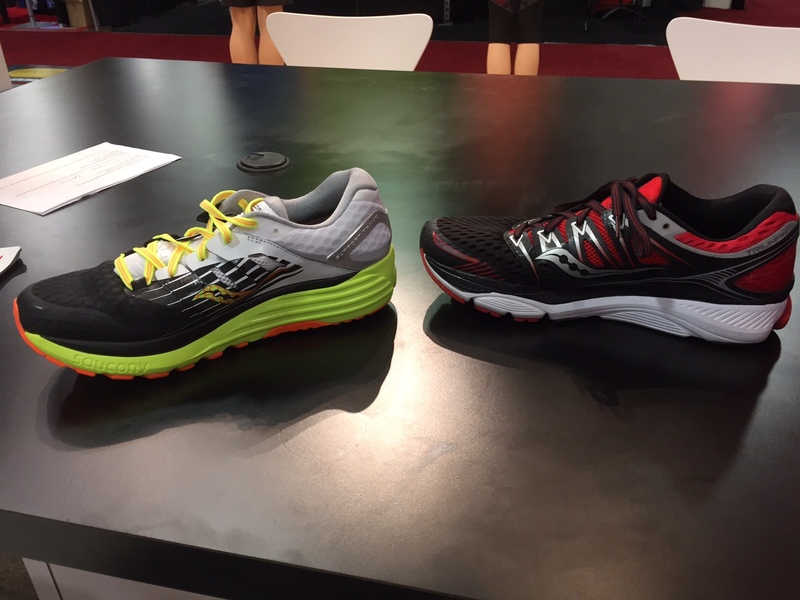 Was a new Mirage shown at Outdoor Retailer? If not, was there a shoe to replace it in the lightweight stability category? No new Mirage shown at Outdoor Retailer Ryan. The closest lighter stability shoe would be the Guide 9 at 9.7oz vs Mirage's 9. Guide has the new full length Everun top sole. Thanks for the info. Do you know if its possible they introduce another shoe, or was their whole 2016 range there?